Hurricane Sandy Recovery - Gridless Power Off-grid, clean, rugged solutions for your toughest power problems. Gridless designs solar batteries with the capacity of a generator. Hurricane Sandy battered the east coast a week ago, knocking out power in the northeast and causing billions in damages and hundreds of deaths. Some of the hardest hit regions were near the Jersey Shore. Gridless’ South Jersey offices were spared from any significant damage. The day after the storm, the Gridless team loaded up the truck with the every product we had, including solar panels and some old prototype units. 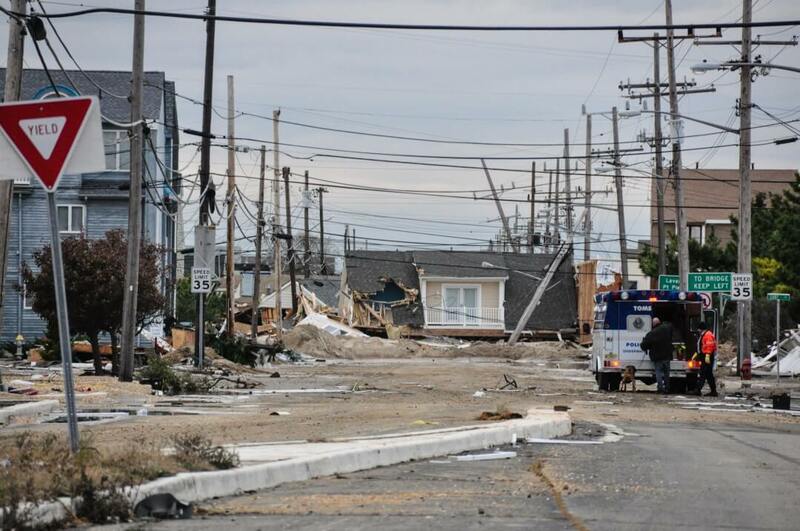 From our friends and family on the coast, we heard about the devastation in Seaside Heights. Officer Gary Przewoznik of the Lakewood PD told us that first responders in Seaside Heights were having trouble charging their communication equipment with the electrical grid destroyed. Toms River Police Captain Steve Henry allowed us into the Seaside command center due to the dire need for power. We need Gridless in Seaside Heights. This is the kind of technology our guys need. We quickly unloaded and set up a charging station on a nearby totaled car. A call was sent out over the radio and local police, firefighters, and NJ Office of Emergency Management (OEM) officials quickly plugged in and charged their long dead cellphones. The team spent the day collecting energy from the sun and charging phones for disaster response teams as well as powering lighting for the NJ State Policeman’s Benevolent Association (PBA). After the first day, security was tightened due to the dangerous conditions. Gas lines continue to leak, the entire network needing to be rebuilt. The Gridless products were integral in supporting the cleanup and the team was given clearance to come back and resupply first responders for the foreseeable future. Powering a Concert Using Only Batteries… Can it Be Done?